More and more Australians are opting for a Self-managed Superannuation Fund (SMSF) to have greater control and diversification in what they can invest their retirement funds in, such as precious metals. Investments that might not be possible with a typical industry superannuation fund. Imperial Bullion helps this growing number of Australians to purchase precious metals for their SMSF as they are allowable assets within an SMSF. A superannuation fund that is diversified with assets not correlated with each other is one of balance gives peace of mind. That is why many SMSF investors believe that holding physical bullion as a percentage of their overall investment portfolio is one avenue that provides balance, diversification and asset protection. Silver bullion and gold bullion can be purchased in all shapes and size providing you with liquid assets that you can sell as you need in smaller amounts. Other larger hard assets or property do not provide this important flexibility within the portfolio. 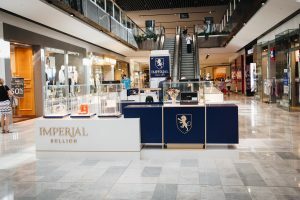 Imperial Bullion for your SMSF Precious Metal Purchases? Price! and service – Imperial Bullion has a low-cost business model which allows us to deliver these savings to your SMSF investment fund. Product prices are linked to the live market and instantly update ensuring that when you are ready with your purchase, the market price is locked in. Imperial Bullion can provide product selection assistance and all other relevant documentation required within the framework of your SMSF. We appreciate that the importance of your decision to include precious metals within your SMSF, and look to support you so that the process of purchasing and receipt of bullion is seamless and secure. Buying gold bullion, silver bullion or platinum bullion for your SMSF with Imperial Bullion is easy. Make your purchase online or come and visit us instore to ensure that any order placed is in the name on your SMSF Trust Deed – the process is no different to a personal purchase, except that we need a copy of the front and signing page of your SMSF Trust Deed before your metal can be sent to you. This copy only needs to be provided once. Having made your SMSF purchase and diversified your investment portfolio, the next consideration is how you securely store your SMSF bullion. Imperial Bullion are not advisers in how you insure, securely store and regularly audit your precious metals SMSF holdings – however, we do recommend the Fortis Vaults facility in Brisbane, Australia. Fortis Vaults are independent and privately owned with a purpose-built facility incorporating multiple layers of security so that you can store your valuables in confidence. Why store your SMSF with Fortis Vaults? Each safety deposit box comes with $10,000 complimentary insurance. Fortis Vaults offer competitive independent annual audits of your holdings in compliance with your SMSF. Comprehensive logistics services are available for secure door-to-door, fully insured, transport of all your precious metals and other valuables. Please visit Fortis Vaults for additional information. Imperial Bullion is a precious metals dealer, specialising in the selling of bullion – we don’t set up or manage your SMSF. Your accountant or financial adviser will be able to provide you with professional advice about whether setting up an SMSF is right for you and – if so – can guide you through the process of establishing your SMSF, setting your investment strategy and managing your investments. There are also multiple online providers that will assist you to establish your own SMSF. Popular options include ESUPERFUND or Xpress Super.